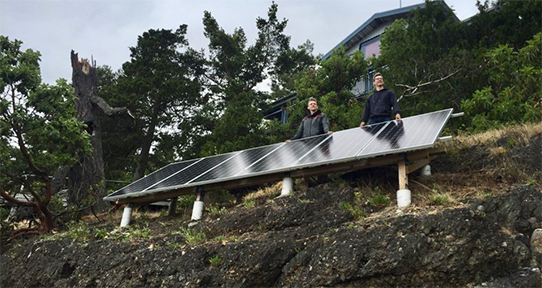 As part of their co-op placement, Kristian Storgard and Michael Addy helped install a solar panel system for an off-grid cabin on a remote BC island. Co-operative Education is a special form of education offering alternating study and work terms while earning your degree. All UVic engineering programs have a mandatory co-op component. Co-op work terms enable students to sample different career areas and clarify career goals. Judge your own aptitudes and talents while earning a good salary to help offset the cost of your education. Establish contacts and references to improve your job prospects after graduation. The best part of the co-op program is students graduate with a BEng degree plus up to two years worth of relevent work experience! All of our students are normally required to complete four co-op work terms in order to graduate. A work term must last a minimum of 13 weeks. While on a co-op work term, our students perform a variety of duties. At the junior level (years one and two of the program), students perform entry level work such as general research tasks, gathering market analysis information, programming, drafting, or assisting engineers in daily tasks. Students on an intermediate-level work term can perform more challenging tasks including the design of mechanical and electrical systems, coding and testing of software systems, hardware assembly and testing. Senior students completing senior work terms function as junior engineers and assist in design work, and provide support in areas like quality evaluations and failure analysis, CAD/CAM, software testing, and manufacturing problems.